1. 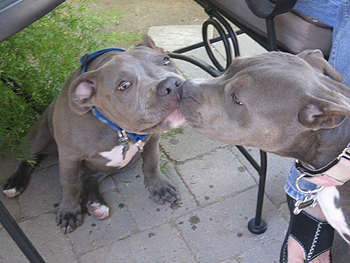 Your dog will benefit greatly from early positive and fun interactions with other dogs. 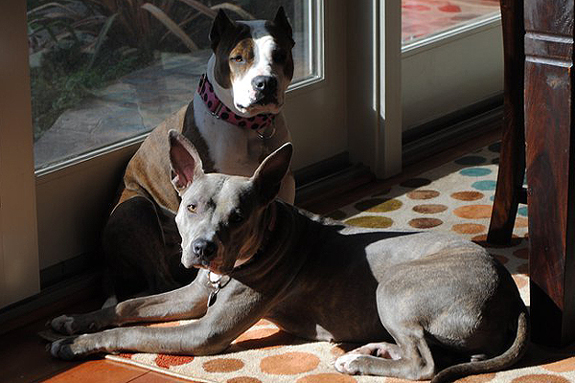 Dogs have a window of time when it’s best to socialize them. Up to about 12-16 weeks is when you want to provide the most socialization with people and dogs. He benefits the most at this time. Of course, these should be positive, controlled interactions. Early socialization is key, and with continued socialization throughout life, your dog will have a better chance of staying social. If you have a pup, vets do tell us not to have our puppies in high-risk areas before all their shots are given. You can still get your pup together with healthy, vaccinated dogs in safe areas. Dog parks, public parks, and public, muddy, grassy areas are not safe. In your yard or a friend’s yard with other vaccinated dogs that are healthy is a great option for socializing your pup (please consult your vet first). Note: Since all dogs are individuals, even when your dog has been well-socialized throughout puppyhood, it’s possible he may still develop issues as he matures. This can happen in all breeds and all types of dogs. It’s not a breed thing, it’s a dog thing. A behavior problem in a dog is a very individual thing regardless of breeding background and training etc. These things must be taken on a case by case basis. However, if early socialization is done, it is less likely that issues will arise. 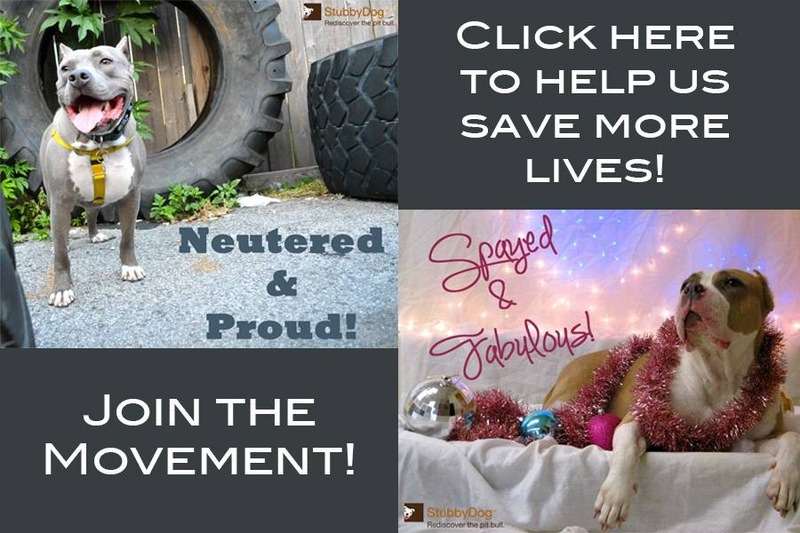 If you’ve adopted a social adult dog, keep up his social nature by socializing him with dogs he’s been slowly introduced to and preferably dogs he knows and enjoys. He/she may also benefit from remedial socialization if he has a background that’s lacking. If you feel a dog you’ve adopted has developed issues call in a trainer to help you. 2. Never let your dog just run up and greet another dog it doesn’t know. This is definitely one way to risk a negative interaction with another dog, and it is also rude canine behavior in general. Likewise, do not allow strange dogs to run up to your dog. This type of “meeting” can lead to an unpleasant altercation, and create a negative experience for all dogs involved. 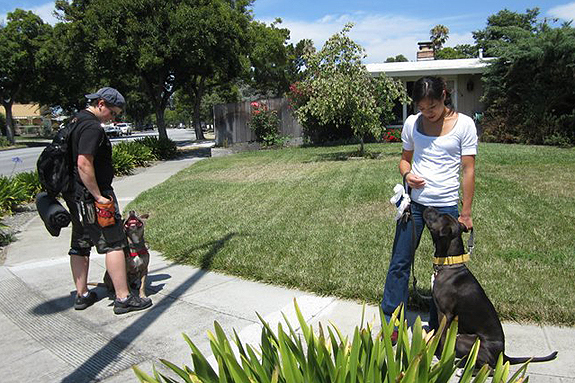 Keep your dog distracted by getting him to focus on you and not other dogs on the street. This will also keep the dogs from staring at each other that may also lead to frustrated leash pulling behavior. Try using treats to distract him. Having your dog stay focused on you and not other dogs will also help prevent leash frustration/aggression. 3. Dogs must be introduced carefully and slowly. It’s best not to allow your dog to meet face-to-face with dogs he doesn’t know. You don’t know if the other dog might be uncomfortable with it or not. Additionally, this can set the dogs up to fail during the greeting. I wouldn’t walk up to you at a party and stare right into your face an inch from your nose! One way for your dog to stay social on the leash is to not let him stare at other dogs. Soft looks are one thing, but another dog can take a harder “stare” as a threat. The dogs may start to react to each other, and over time, with many greetings like this, your dog may become conditioned to respond to dogs this way while walking on leash. Keep your dog focused on you and keep it as positive as possible. This way he will find that seeing dogs is a positive thing and not threatening or uncomfortable. If you’re introducing dogs for a play date, let arousal levels go down considerably before letting dogs greet if they’re excited. Let dogs get used to each other’s presence before letting them interact. It is best to take them on a walk side by side first so that they can get acquainted in a non-threatening fashion. Then let them greet side by side if possible not nose to nose. Nose to rear is normal and a good way for dogs to greet. Read more on Dog-Dog Intros. 4. Dogs should not learn to socialize at dog parks. While some dogs may enjoy the dog park, lots of folks use the dog park to “exercise” their dogs to compensate for lack of activity. Dogs may come to the park overly excited and aroused. With a lack of management on the humans’ part, this can create a free-for-all atmosphere where anything can happen. Your dog can get pushed around by other overly excited dogs. Also, if owners aren’t watching and a fight starts, it’s a sure bet your dog will be blamed. It’s really the humans that are more the problem at dog parks, not the dogs! Public dog parks really aren’t a good place for socializing because the humans often don’t manage their dogs, and this can create an uncontrolled and negative environment for any dog. Finding friends with dogs your dog enjoys is best. Have get-togethers with dogs you’ve introduced slowly, and keep things controlled and positive. This way you can avoid negative experiences for your dogs. See Dog Parks. 6. Keep your dog as social as possible throughout his life. You can do this by finding friends with balanced dogs. Things usually go well under good supervision after slow, appropriate introductions. You should also take him to a good leash manners class that encourages him to be more focused on you and not the other dogs in class by using distraction techniques. Establish leadership in class and extend that leadership over to playtime. While your dog is at play, work to have good positive control over him. Continue play groups often, and classes periodically to maintain good leash manners throughout your dog’s life so he remains desensitized to being around other dogs on leash. Dogs of all kinds benefit from good positive leadership and structure throughout their lives. For more info on classes go to our Classes page. Question…I have a rescue Boston Terrier, from a Puppy Mill, found roaming in a section called “coyote alley” and picked up by a high kill shelter. Very happy he found his way to us. Anyway, he obviously was not socialized. I bring him on walks, have him in a “professional” playgroup with a trainer 1/2 day/week and bring him to the park. I did notice he tends to be ok meeting dogs when he can sniff from the back, but NEVER front-to-front meetings! Ears go back, then he tries to go behind; if the other dog does not let him, my dog will walk as far away from the dog as possible (I say good boy -better he takes the “safe” route”). Being a “lay” person, I was surprised to see he was correct. When meeting another dog just walking down the street how is it best to work this? He is now almost five and I need to keep working with him? Do a “shout out” to the approaching person, and explain the proper meet n greet way? He tends to ver very timid, and doesn’t “play at parks. He plays ball with me. He has only interacted with other dogs in play a handful of times. It’s not natural for dogs to greet dogs they don’t know nose to nose. This is expected that many dogs (many don’t mind though) will become uncomfortable with this sort of greeting. Also, your dog doesn’t have to greet dogs he doesn’t know in public, just dogs he plans on having a playdate with etc. I have written a couple of articles on the subject that I hope will help. One is on how to intro your dog to another dog. Let me know if you have further questions. http://www.ourpack.org/dogdogintros.html http://www.ourpack.org/aggressreactivity.html and http://www.ourpack.org/dogparks.html Let me know if you have further questions and I hope you find this helpful!